A professional photographer in the media industry for 35 years, Steve has been teaching photography for the past four years at his Gold Coast courses. His career hasn’t just been about shooting sports and news though. As a father of three, Steve also understands the challenge of capturing great shots of his children and those precious moments of ordinary family life. Steve covered news and sport for The Sydney Morning Herald, The Sun Herald and The Melbourne Age. He also spent 20 years as a freelancer for The Associated Press (AP) and counts national magazines, the UK press, public relations firms, private businesses and government agencies among his satisfied clients. His experience in photographing international sporting events, like The Australian Open, the Olympics and the America's Cup, have given Steve his amazing ability to capture that priceless moment. His photos reveal impeccable attention to detail, whether it's an evocative portrait, an animal in close-up, or a celebratory shot of a winning athlete. Steve's photos have been published in numerous international and national newspapers and magazines; and in his book "Australians: the people and their stories", published by Simon and Schuster. 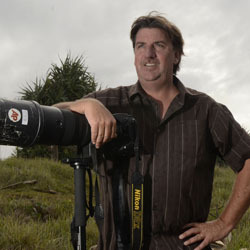 Previously, Steve was an Associate Lecturer at Griffith University in ePhotojournalism. Now running his own business, he wants to keep sharing his wealth of knowledge with aspiring photographers, whatever their goals. Listen to and interview with Steve by ABC Gold Coast Weekends Peter Scott.